Stunning Condos in Cuenca Starting at $105K - Live in Ecuador's Most Desirable City! Welcome to TORRES DE LUCA, a spectacular modern and exclusive community, carefully designed to offer a unique living experience in the beautiful city of Cuenca, Ecuador. 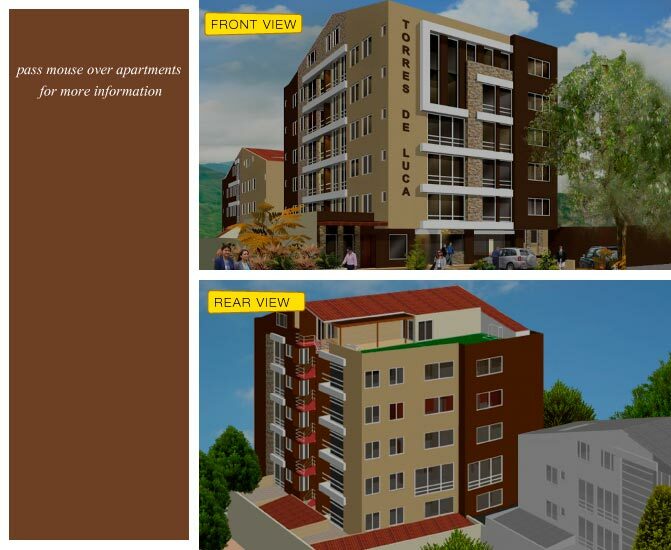 It has 2 buildings with a total of 36 units, of 1, 2 and 3 bedrooms, in an unbeatable distribution of just 4 apartments per floor. All units are made with the strictest quality standards, avant-garde designs, comfortable spaces and the highest technology in finishes. The location of TORRES DE LUCA is really privileged, since it is only 15 minutes from the Historic Center of Cuenca and close to shopping centers, public transport stations, schools, pharmacies, large play areas and meetings for co-owners. Living with luxury and comfort at an affordable price is possible in TORRES DE LUCA, since the community has multiple financing modalities for up to 25 years, so do not wait any longer and come and get to know your new apartment today! Torres de Luca was designed with earthquake resistant technology utilizing reinforced iron and high strength concrete. Construction is nearing completion, and as a self financed project, the building and amenities are in no way contingent upon sales. All apartments enjoy underground parking facilities, security cameras with 24hr monitering, an emergency generator, Mitsubishi elevators and a fire protection system. Each apartment enjoys modern finishings, with the option to customize rooms to your liking. That means that if you act quickly, you can choose your own flooring, kitchen appliances, and even customize floor plans to fit your liking. The rooftop terrace enjoys a game room, as well as spectacular views of the city center. WHY INVEST IN TORRES DE LUCA? • High value area | • Retail Outlets | • 4 apartments per floor | • Just 15 minutes away from the historic city center | • 5 minutes away from shopping centers | • 5 blocks away from the light rail station | • Large areas of games and meetings for joint owners | • Excellent natural lighting in shops | • Avant-garde designs | • Competitive pricing | • Payment facilities. Tower 2 is now ready, so you can come today and see our latest available condos, all with amazing finishings and best quality as Tower 1. This Tower is connected to Tower I by a crossing hall. This Tower has 5 floors with only two apartments per floor and, right on the top floor, there's an awesome Pent-House, embracing the whole floor. There are two condos with 3 bedrooms and the remaining ones with 2 bedrooms, all with high quality finishes! Cuenca is truly a unique city, coupling colonial charm and picturesque landscapes, modern amenities with old world traditions. It is located at the intersection of 4 rivers, at nearly about 8000 feet above sea level, and is known as the city of the eternal spring. While the city can be cool at times, it is never cold, and enjoys at least few hours of sun each day. While no city is impervious to crime, most expats who live here attest to feeling safer than in most American cities. It is a city which is extremely walkable, and while one can enjoy a dose of nightlife in El Centro or La Zona Rosa, the vast majority of Cuencanos are conservative in values. Restaurants and bars tend to close relatively early, and on weekends the city´s array of beautiful parks are filled with families, sharing picnics, playing soccer, or flying kites. It is a city who´s inhabitants enjoy a healthy lifestyle. Cuenca´s environment is spectacular. Water can be taken directly from the tap, as it is some of the purest anywhere in the world. If you are coming from a large city, you will notice the cool, polutant free air as soon as you arrive. In terms of shopping, Cuenca has everything you need. Supermarkets offer an incredible diversity of products and while imported goods will come with a higher pricetag than you may be used to, most adapt recipes and purchasing habits relatively quickly. Local markets are spread out all over the city as well, where fresh fruits and vegetables are always available. Cuenca´s hospitals are also world class, and most expats report having enjoyed excellent health care at a fraction of what they would be paying in the U.S.
Cuenca enjoys a large expat community, largely comprised of retired American´s and Canadian snowbirds. Many who now call Cuenca their home strive to make the community a better place, acting as volunteers, consultants, or opening small business. Catovi is a young construction company in Cuenca, created with the purpose of offering high quality housing with construction standards which have long been lacking in Ecuador. They strive to improve the quality of living for both their clients, and all Cuenca´s citizens. Catovi seeks to be known as one of Cuenca´s premier builders, offering their products at an affordable price point. Honesty, punctuality, and work ethic are the cornerstones of their company. CATOVI is a young company established in the city of Cuenca created to provide housing solutions to citizens seeking to provide a service with high standards of quality in the construction area. Our vision is to consolidate our position as one of the best companies in the construction area, offering quality service at affordable costs.